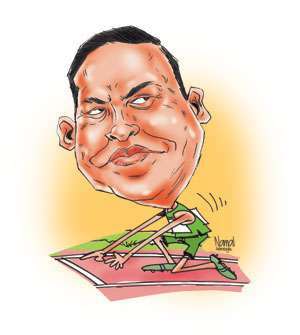 It will be easier for the UNP if former defense secretary Gotabaya Rajapaksa contested the 2020 presidential election, UNP Propaganda Unit Chief and Minister, Harin Fernando said today. He said many have failed to understand the mature democracy that is prevailing in the country. “Mature Democracy is the reason why people cannot understand the truth. Many think that this government is timid and has no backbone. The President and the Prime Minister are attacked on Facebook. Some think that both of them have become jokers, there is mudslinging everywhere. Media can fabricate news. These are all features of a mature democracy,” he said and added that even the head of state could be criticized amid an environment of a mature democracy. Hey man, I am contesting. I am clean with no record of corruption and bank robberies. This is the type we will vote for next time. Blue or green you are the same. That can be considered the statement of the decade. What happens if Ranil, you leader contests. It will be a cakewalk for any one. One sec, that includes me. I have a better chance. whether pohottu horas like it or not we will field a common candidate and we will beat you uneducated rural bayyas. Yes. UNP can go away from a Google Balloon. First full fill the manifesto of 2015 before talking bana about 2020. Howcome gota contest election?.who pardened him for accused crimes???. I dont know whether AMERICAN citizens can contest SL elections. Gota will be defeated but only by a coalition of UNP SLFP JVP TNA SLMC JHU. Wait a second isn't that all established political parties against Gota? That should tell about the popularity of the man. You can win by promising various things to TNA and Badurdeen but these 4 years showed us that you can't and you have no interest in developing the country. Sadly our people are politically blind. My calculation is 40% idiots will believe your fairy tales. 50% will take a chance with Gota. 10% will place their trust on Rohan Pallewatte. Right. And will you promise free wifi again in 2020? JVP will demand a big bribe in 2020 to support Ranils common candidate and will slide from 6 seats to 4 seats in the parliamentary election as a result. Premadasa could have learnt a lesson or two from Malik on how to cripple political camps without killing its members. Only 51% believed your allegations in 2015. What make you think 50.1% will believe your allegations after 5 years of failure? UNP should groom a candidate for 2020.RW you have destroyed the grand old party, do the country a favor pack your bags and get the hell out of there, You are a born Looser. If a Donkey contest against the UNP the Donkey will win not the UNP. sounds to me these guys want Gota to contest.and they know Gota will win hands down,but if he is elected SINHALA BUDDHIST will have no protection.